Scott Cheney grew up in Phoenix, Arizona and attended the University of Arizona for his undergraduate degree in molecular and cellular biology. He also attended medical school at the University of Arizona and graduated in 2009. Following this, he received his urology training at the Mayo Clinic in Arizona, from which he graduated in 2014. He now works as a Senior Associate Consultant at Mayo, and is involved with teaching residents and fellows. 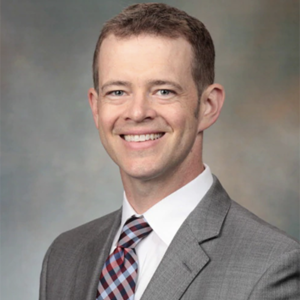 Dr. Cheney’s clinical focus is treatment of benign prostate hyperplasia (BPH), kidney stones, and minimally invasive surgery for urological cancers and benign disease. He performs HoLEP, HoLAP, TURP, Rezum, laparoscopy, and robotic surgery of the kidney, ureter, bladder, and prostate. His research interests include BPH and prostate cancer. Other interests of his include global health, as he often travels to Haiti to participate in local clinics and teach urologists there. 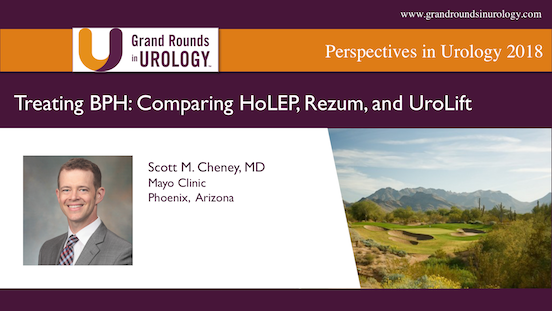 Scott M. Cheney, MD, reviews the background and practical application of minimally-invasive surgical therapies and definitive therapies for benign prostatic hyperplasia (BPH). He then discusses patient selection for these therapy options based on recommendations, level of evidence, and comparative outcomes.